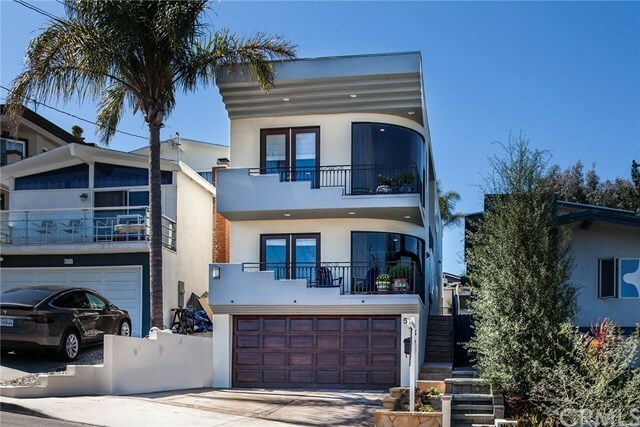 Well Maintained Manhattan Beach Hill Section Single Family located in the Robinson School District. Amazing city and mountain views from the living, dining, kitchen, and den! Beautiful hand scraped hardwood floors throughout, spacious chefs kitchen with Viking Professional stainless appliances and custom cabinetry. There are soaring ceilings, custom wrought iron handrails and spectacular single pane custom curved floor to ceiling viewing windows on two floors. Within the (approx.) 2470 sq ft of living are 3 oversized bedrooms 3 large baths, a great room, dining, second living/library and three balconies with views. The backyard boasts a flagstone saltwater Spa-Pool with waterfall and swimming jets! Some of the many recent upgrades and amenities include new HVAC and AC, new water softening system, tankless water heater, newer roof, newer carpets, Bosh quiet dishwasher, upgraded irrigation system, upgraded pool equipment and fresh paint! A one-of-a-kind truly lovely home.